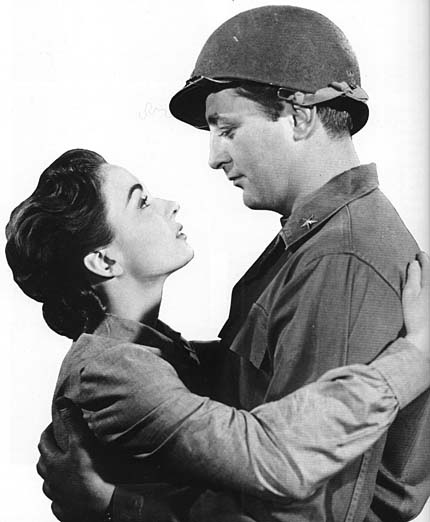 ONE MINUTE TO ZERO has Robert Mitchum vanquishing acres of Commies in Korea in this 1952 bull directed by Tay Garnett. Well, how dare they invade their own country!? Howard Hughes shelled out $2,181,000 for the production, but a war-weary public retreated, leaving only $1,600,000 for Howard to then waste on Jet Pilot. 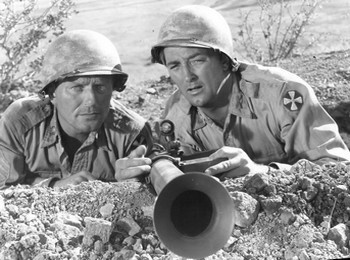 Mitchum appeared, doing bits or starring, in sixteen war films as well as the miniseries The Winds Of War and War And Remembrance. They include classics like The Longest Day, Thirty Seconds Over Tokyo and Heaven Knows, Mr Allison and turkeys like Anzio, Breakthrough and Midway (to Bob, a check was a check). Guess where this one lines up? Easily (uh, do we think too easily?) chopping Reds to statistics are William Talman, Charles McGraw, Margaret Sheridan, Richard Egan, Eduard Franz, Hal Baylor, Robert Bray, Roy Roberts, Stuart Whitman and Bobs’s younger brother John. The miserable “police action” of 1950-53 did not deserve this nonsense piled on its heap of crosses.